Father's Day debuts at #3 on the Billboard Blues charts & stays on the chart for six weeks. The title of the new CD has special significance for Ronnie, who found healing with his father, Jerry Akos Horvath, on Father’s Day of last year. Jerry was a Holocaust survivor, as was his mother Rose, and was liberated from Auschwitz in 1945. Both of Ronnie’s parents died in 2014. Ronnie made peace with his father after having had a rocky relationship, which had both its ups and downs, joys and struggles. In the song, realizing that time is short, Ronnie asks the listener to ponder the price of living with resentments in a series of questions: “Can you make peace? Can you be the generous one? Can you forgive? Can you cancel all the debt?” Ronnie’s deeply felt guitar voice and the equally heartfelt vocals, sung by Michael Ledbetter, lead the listener to a place of hope when forgiveness happens and resentments are left behind. Do you know that your family is so dear? It didn’t happen until last Father’s Day we said everything that we had to say. Ronnie Earl, BMI, Mr. Earl Publishing, Administered by Happy Valley/Concord Music Group. 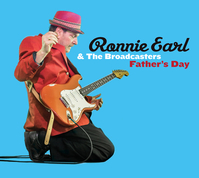 Thank you for visiting the website of Ronnie Earl & The Broadcasters and for adding Father’s Day to the soundtrack of your life. It has been a great joy to work with every one of these musicians and witness their gifts and skills as they put their heart and soul into every note. Ronnie draws from an endless well of musicality and creativity that is grounded in the traditional blues as he hears a new album beginning to take shape. I truly believe he feels the sound forming in his soul and it is a joy to see how he and the band bring the music to life. We hope you enjoy the new album and find inspiration, hope, resolve and joy within its musical storyline. More about our friend Diane Blue. More about our friend Michael Ledbetter of the Nick Moss Band.